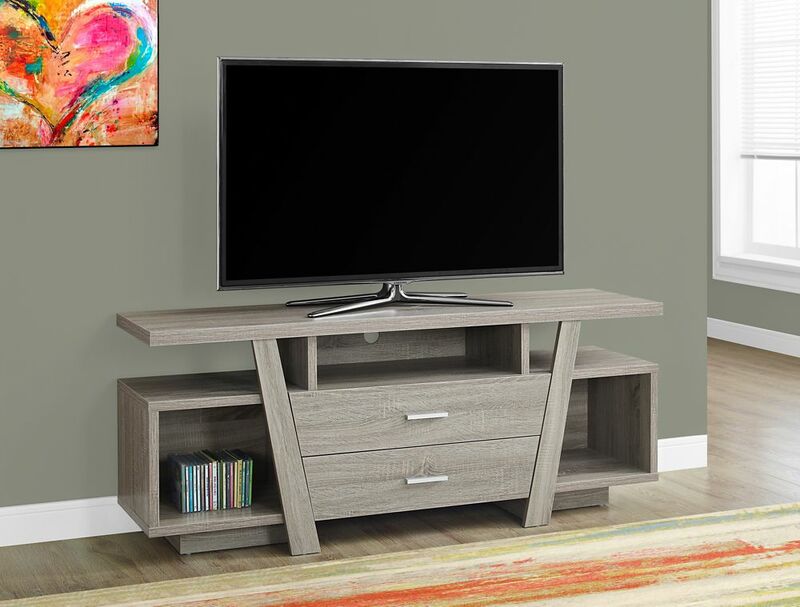 Grab your guest's attention with the contemporary styling of this 60" long TV stand. Constructed with thick panels in a chic dark taupe reclaimed wood-look finish, this stand features open concept shelving and two storage drawers ideal for keeping your electronic components and accessories organized. Featuring symmetrical lines and a unique flair this tv stand is a must have in any modern entertainment room. Enjoy prime-time entertainment with the Jackie TV stand, a Mid-Century designed, functional and versatile piece that promises ample storage space, clean silhouette, beautiful finishes, so you can entertain and host your friends and family in style. Elongated shelving, a smartly built cabinet, and a pair of drawers, offer space for storing remotes, magazines, DVD player or Blu-Ray systems, the Xbox, and help solve all your media accessory needs. Natural pine, artful splayed legs, and expansive display top ensures your hosting the next movie night in. With the Jackie TV stand, it's bound to be the best one yet. Fit any floor plan and space with this Monarch Specialties TV stand. The brown free standing TV stand can accommodate a television of any size up to 41-inch to 50-inch. Use this piece as a handy place to store movies, gaming consoles, and even speakers. Tv Stand - 60 Inch L / Dark Taupe With 2 Storage Drawers Grab your guest's attention with the contemporary styling of this 60" long TV stand. Constructed with thick panels in a chic dark taupe reclaimed wood-look finish, this stand features open concept shelving and two storage drawers ideal for keeping your electronic components and accessories organized. Featuring symmetrical lines and a unique flair this tv stand is a must have in any modern entertainment room.